We found George today. He left from Boulder, Colorado, on 2 March 2016 and it took him a little over a year to reach our office in London, UK. George is a $1 US dollar banknote, serial number K46666438C. You can track his journey on wheresgeorge.com. Welcome to the wonderful world of currency tracking. 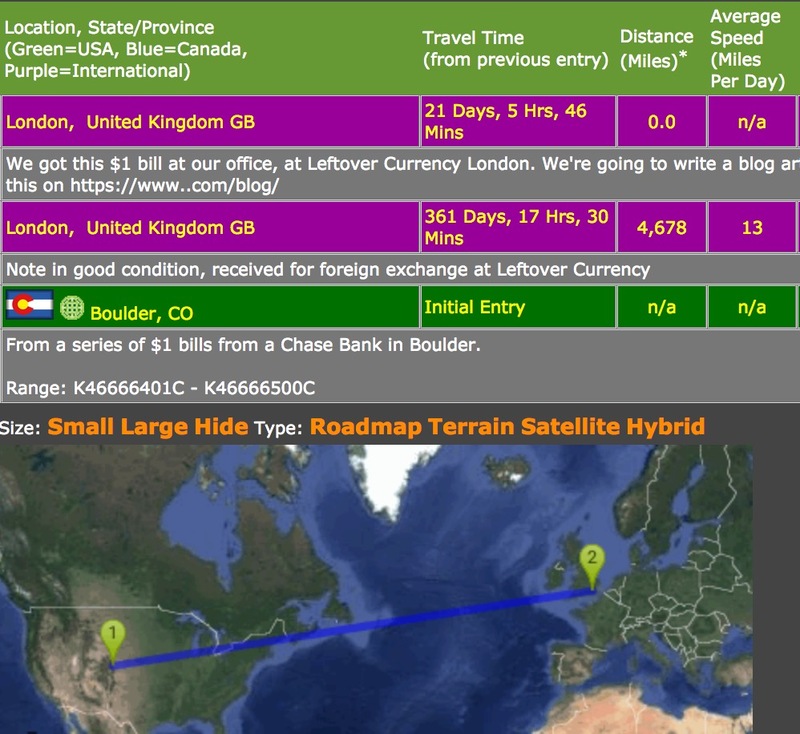 Currency tracking is a niche hobby, much like plane spotting or bird watching. Each banknote has a unique serial number, allowing ‘currency trackers’ to track every banknote’s journey. A user may register a banknote by entering its serial number, and if someone else has already registered the banknote, its “route” can be displayed. The leading currency tracking website is wheresgeorge.com. The site says that more than 270 Million banknotes, with a total face value of more than $1.45 billion US dollars have been registered in its database. Its equivalent for Euro banknotes is eurobilltracker.com. Currency trackers aim to score ‘hits’. A hit happens when a banknote that you registered is re-entered into the database by another person. Collections of hits are called ‘bingos’. The most sought after is the ’50 State Bingo’, which requires getting a hit in all fifty US states. A common way to get more hits is to write or stamp text on a banknote, encouraging people to visit a currency tracking website and track the banknote’s journey. It has been argued that to write or stamp text on a banknote equates to defacement, and is therefore illegal. But a US Secret Service spokesman has pointed out that marking US banknotes is not considered to be defacement, as long as the banknote remains fit for use. However it is illegal to add ‘advertising’ to US currency. For this reason all of the currency tracking websites have ceased selling rubber stamps with their brand name on it. Now you’ve been introduced to currency tracking, why not give it a go yourself next time, and find out where George travels to next.